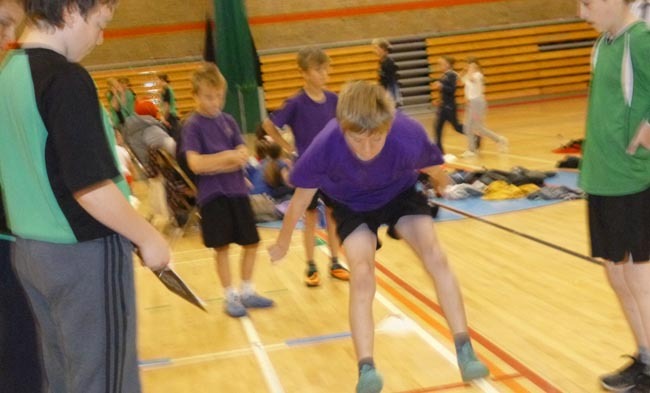 Several weeks ago, at Newton Aycliffe Leisure Centre, seven schools went face-to-face in a battle of athletics and sport. These schools were: Stephenson Way, Broom Cottages, St Johns, St Michaels, Byerley Park, Victoria Lane and Rosa Street. Even before the event began you could tell everybody was pumped. The boys started with their relay events whilst the girls did their field events. Some girls that won in their field events in Stephenson Way were: Kelsey with 4.10m in the standard triple jump, Ebony in the chest push with 6.25m and the javelin in which Olivia threw 9.10m. Meanwhile, the boys were competing in their relay races. To start Stephenson Way off were Kian and Cameron who won their heat. Another notable race was the 4×1 relay which Stephenson Way won. Then the boys switched with the girls as they then went to do their chosen field events whilst the girls did their relays. In the javelin, Tristan got the farthest with 14.46m, which is an excellent distance. Over at the vertical jump, Liam Mcgrath, Spencer Soakell and Jack Browning all got the same with 31cm on the wall. Along with all this Tristan got the most in the standing triple jump with a tremendous 5.05m. But for now, we go over to the girls and their relay races. First up was the 2×1 relay, in which the girls came 2nd. Another mentionable performance for the girls was their obstacle course relay in which they, once again, came 2nd. Around this moment, the teacher from Stephenson Way could be quoted as saying her team performed “perfect forward rolls”. In the boys’ obstacle course in which they took 1st place. The boys, during the whole thing, were incredibly fast in the competition, they were on their top performance. That was not all as the girls began their under-over relay which, of course, involved going under and over things. Once again they did well to come 2nd. Throughout the day, all the teams were talking to each other and thinking about strategy for the races ahead. Finally came the boys version of the under over relay which they won. That was the last of the races, so then came the presentation and everybody’s places. Most notable were 1st, 2nd and 3rd. In the end, the one that came out on top was Broom Cottages with the overwhelming 1st place. Secondly, with the silver, was St Johns in 2nd place. Now with the bronze medals, was a very surprising tie between Stephenson Way and Byerley Park. Well done to all the people from all the schools that took part and did their best.